Archives of Eaton Bray News for June 2013. This article was published in June 2013. Please see Latest News for more recent information. Congratulations to the children in our church family for their excellent rendition of the story of Noah at our Sunday School Anniversary. We are so lucky to have such a super group of youngsters who have great confi dence and love to perform and be involved in our services. Our special thanks to our Sunday School leaders, Helen, Paul and Mike, and to our young helpers Rona and Jackie for all their commitment to making Sunday School so very special for the children. Our cooks are to take a break during July, August and September but promise to be back on Saturday October 12th with Cafe Community from 11am to 1pm serving lite bites and beverages. Cafe Worship will continue on the 2nd Sunday of each month as normal. July 14th led by Rev. Andy Melvin and August 11th led by Rev. Jenny Spouge. Everyone is welcome. 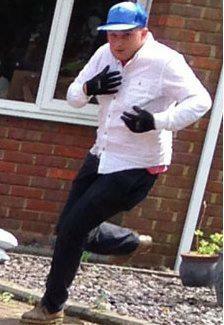 The picture, taken on Wednesday in Eaton Bray, shows a man in a blue cap and gloves apparently running. Police said three men had set off an alarm at a property in Wallace Drive. The neighbour who took the photo was slapped across the face, police said. The men drove away in a black Mercedes with stolen number plates on display. Det Sgt Dale Mepstead said he wanted to speak to anyone who could identify the man in the photo or who witnessed the break-in, at about 14:20 BST. "The neighbour was very brave to challenge these men and luckily she was not hurt during her ordeal," he said. "The property belongs to an elderly person and it is possible that these men chose this address because they thought it belonged to a vulnerable member of the community and therefore an easy target." Police said nothing was taken from the house. This temporary road closure is required to facilitate the holding of St Mary's Village Carnival Procession and shall apply to such extent as may from time to time be indicated by the appropriate traffic signs. The proposed Order will come into operation on 6th July 2013 for a period of one day. For further information please contact Eaton Bray Parish Council, tel. 01767 642412. You are viewing the June 2013 archive.